“Fair” Work Australia’s decision to slash penalty rates for thousands of hospitality, retail and fast food workers is a disgraceful attack on workers’ rights. Workers depend on penalty rates to pay their bills and make ends meet, penalty rates are a fair and equitable recognition work being done during unsociable hours. The Greens will continue to stand in solidarity with workers who deserve their penalty rates legislated and protected. “Fair Work Australia’s decision to slash penalty rate is a disgraceful attack on workers’ rights that will leave thousands of hospitality, retail and fast food workers worse off. 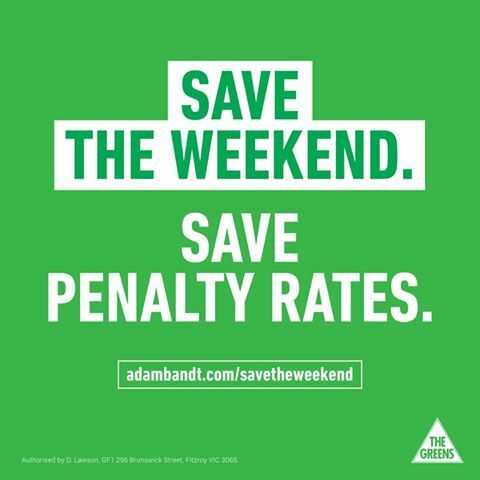 “Penalty rates not only compensate for the social loss on weekends, but can make the difference between missing and making mortgage, rent and bill payments. “The real life cost of these cuts is that fast food workers Sunday wages will go from $29.16 an hour to $24.30 an hour, because apparently workers on $38,000 a year are earning too much. “The fact that this decision was made by a five member tribunal that collectively earn a $1.4 million base salary makes it all the more disgraceful. “This confirmed the Greens NSW position to retain a state based public industrial relations system to deliver fair wages. “Workers deserve to have their efforts valued and their penalty rates protected through legislation, this is exactly what my Australian Greens colleagues will vote for in Federal Parliament.” Mr Shoebridge said. How much are Fair Work Commissioners paid?